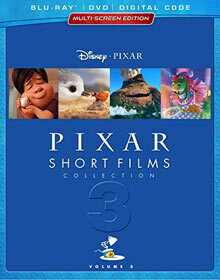 Six years ago to the day, Pixar released the second volume of animated short films as a separate collection for fans to take home a batch of the littler doses of Pixar goodness. Volume 3 is now here and it unites another group of short, animated cartoons Pixar has released either in theaters with one of their featured films, or via the home release of these films. Leading the pack is the latest short, “Bao,” which preceded this past summer’s Incredibles 2. It may be one of the oddest stories yet for the shorts, but it’s loaded with heart as it showcases a Chinese mother dealing with empty nest by reliving parenthood when a dumpling she makes in the kitchen comes to life and she suddenly becomes a mother once again. The rest of the shorts here are a mix of original stories and side stories for known, beloved characters. A personal favorite is “Partysaurus Rex,” where Rex from Toy Story joins the tub toys for a magnificent dance rave. Similarly, we get to see “Party Central” in the Monsters University world, where Mike and Sully hijack a huge frat party and bring it to their sorority, with the help of the human “door stations” (we do see them with unidentified drinks in cans as they have a rowdy party, just FYI). “Piper” is an original, which utilizes jaw-dropping photorealistic animation to bring a baby bird to life on a beach. “Lava” is a fun and cute love story involving a pair of volcanoes, while “Riley’s First Date?” serves as a hilarious follow-up to the feature film, Inside Out. “The Radiator Springs 500 1/2” is a fun additional Cars adventure, but it isn’t really one of the highlights, while “Miss Fritter’s Racing Skoool” isn’t quite the “mini-movie” advertised here as it’s literally just a mock commercial for Miss Fritter’s racing school, with testimonials from various cars. Similarly, “Marine Life Interviews” was a bonus on the Finding Dory release and is just included here as a bonus. “The Legend of Mor’du” released with 2012’s Brave and features a witch telling the story of the beast Mor’du, with the story being presented in painterly, lightly-animated images (with some creepy imagery as well). It’s a short you should definitely watch only if you’ve already seen Brave. Otherwsie, it will spoil some of the film’s plot for you. “The Blue Umbrella” is from 2013 and features cute, colored umbrellas that fall in love, and “Sanjay’s Super Team” is based on a true story about a little Indian boy who loves superheroes trying to relate to his father during a time of prayer and reflection (and the two worlds collide in a big, big way). Finally, “LOU” is about a box of lost and found objects that teaches a playground bully a lesson. It’s pretty cute and heartwarming, but it’s also a bit heartbreaking to see the bully terrorize the kids. It has a great twist (and message) at the end, though. To sweeten the Pixar Shorts pot, however, each short has an introduction from the film’s director that tells a bit about the story you’re about to watch. There’s also optional commentary for them. Overall, I’d say this set is more for completists and diehard Pixard fans than anyone else. I can’t imagine many wanting to watch this whole batch over and over as a feature, but there are definitely some real gems in the mix (like the Toy Story and Monsters shorts, especially). Caricature: A Horrible Way of Saying “I Love You” (3:53) – The Pixar team show us a party they have where the artists make caricatures of each other… which can get a little rude. But it’s an interesting practice for sure.